If you are searching for a memorable, fun, and family-friendly acoustic experience in the Tampa Bay area, you have found it!! 1. Solo performance - I play guitar and sing songs arranged for a one person performance. 2. Guitar/ singer Duo - I can bring along other talented musicians, most of whom, can provide improvisational guitar sounds, lead, rhythm and vocal support. Sometimes we will switch "duties" and take turns being creative and feed off of crowd stimuli. Fun, hard work, and some spontaneity (musically!! :-)). 3. I can also invite as a third musician who can play the cajun beatbox for rhythm. Greetings, and thanks for viewing my promo kit!! This is an exciting opportunity for me to "delve into" the live music scene mostly as a solo musician. I hope to upload some pictures and sample songs, too. In the interim, I can be heard playing at Love's Artifacts every Monday evening where I host open mic night. I also can be found on youtube under letet2010 as a search. 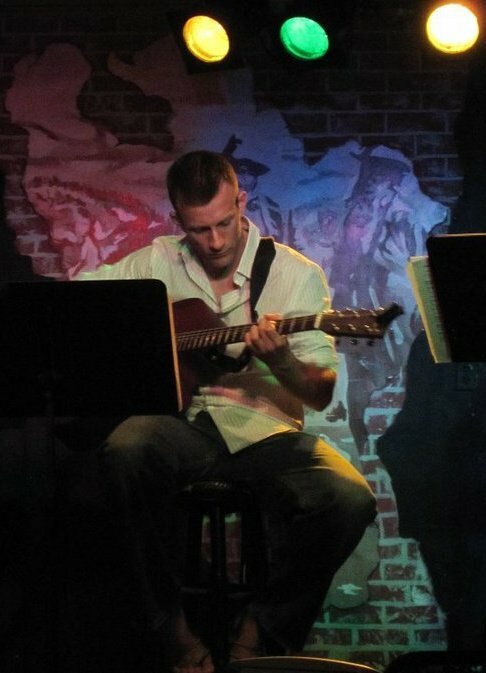 Basically, I perform as a solo guitarist/ singer in a variety of settings or capacities. Whether it's a maxed out beach bar patio, restaurant, private or corporate party, coffee shop or lounge, I love to perform and can adjust my playing/ volume to suit whatever situation. I like to be creative in my interpretation of songs yet maintain the recognizable elements of them. Perhaps you have seen me play before at Sakana Sushi, Love's Artifacts, BarFly, Cork N' Olive, Ozona Pig, Everything Dolce, or other venues around the Tampa area. Perhaps you have even see me play at our church in South Tampa. I also played gigs while stationed in Germany when I was in the Air Force. I consider myself to be a stripped down guitarist - that means, apart from my amplified acoustic guitar and vocal mic, I use no effects other than those that come pre-loaded on the equipment I use; I use a Soloamp by Fishman (220 Watts) which is enough for restaurant and beach settings. I sometimes will use a little reverb or chorus depending on the song. My goal is to preserve the natural sound as much as possible. My song variety is rather eclectic and it grows virtually daily and with each musical influence I encounter whether it be someone in the audience with a suggestion, a song I hear on the radio, or at the store, or I hear on Youtube. My selection ranges from the Beatles, Ray Lamontagne, Coldplay, Peter Frampton, John Mayer, etc. I love acoustic songs which add to the experience of a beach lounging kind of day. Thank you for checking out my profile and I hope to be a part of your next celebration, may it be a birthday party, corporate event, or public venue. My live performance gear consists of an amp (Soloamp by Fishman - 220 Watts), an electric-acoustic guitar, and microphone. I can use a looper but typically do not as I prefer to keep my songs straightforward.